Last month I wrote a post introducing the concept of mindful eating and promised to follow up with ideas for putting mindful eating into practice. Keeping that promise, I present to you a list of practical ways that you can make mindful eating a part of your life. As fair warning, this list is a bit overwhelming so try to not let it swallow you alive. My recommendation is to read through the tips and pick one or two that jump out at you. Practice them for a couple of weeks and then evaluate the value they hold for you and how you want to move forward. And remember, when it comes to making lifestyle changes, think in terms of slow and steady or consistency and sustainability instead of huge changes made hastily. Finally, when you are ready to bring your mindful eating to the next level, challenge yourself by incorporating another tip. 1. Give thanks for your food or say a prayer before eating. This is a wonderful way to connect with your purpose for eating, a nice cue to bring awareness to your hunger levels, and a reminder to savor your food. 3. Keep a food and mood journal for a week. 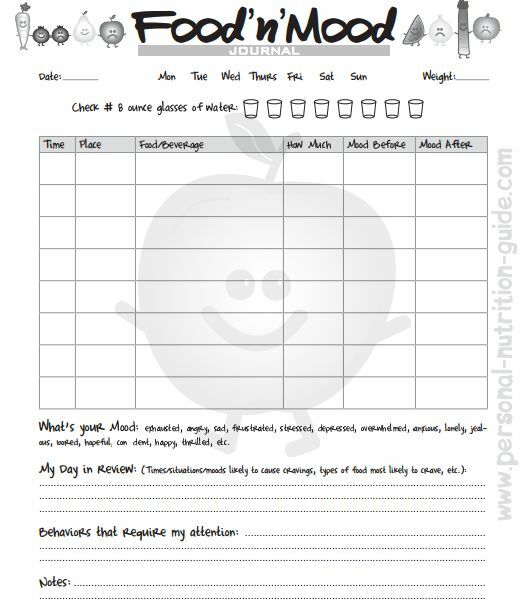 This is a great exercise to bring awareness to why you are eating (hunger, emotions, stress, etc.) and can help you make empowered choices on how you want to react to eating triggers that aren’t serving you in the future. 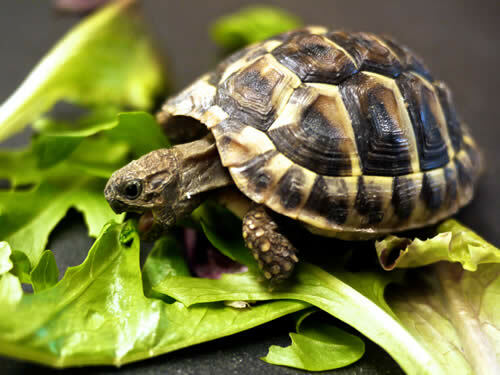 Eating slowly doesn’t have to mean taking it to extremes. Still, it’s a good idea to remind yourself, and your family, that eating is not a race. Taking the time to savor and enjoy your food is one of the healthiest things you can do. You are more likely to notice when you are full, you’ll chew your food more and hence digest it more easily, and you’ll probably find yourself noticing flavors you might otherwise have missed. If you have young children, why not try making a game of it — who can chew their food the longest? Or you could introduce eating with chopsticks as a fun way to slow things down. 5. Silence the phone. Shut off the TV. Our daily lives are full of distractions, and it’s not uncommon for families to eat with the TV blaring or one family member or other fiddling with their iPhone. Consider making family mealtime, which should, of course, be eaten together, an electronics-free zone. I’m not saying you should never eat pizza in front of the TV, but that too should be a conscious choice that marks the exception, not the norm. Mindfulness is really about rekindling a relationship with our food. From planting a veggie garden through baking bread to visiting a farmers market, many of the things we locavores have been preaching about for years are not just ways to cut our carbon foodprint, but also connect with the story behind our food. Even when you have no idea where the food you are eating has come from, try asking yourself some questions about the possibilities: Who grew this? How? Where did it come from? How did it get here? Chances are, you’ll not only gain a deeper appreciation for your food, but you’ll find your shopping habits changing in the process too. Did you ever eat an entire plate of food and not taste one single bite? Bring all of your senses to the dinner table. Breathe in the aroma of a fresh loaf of bread. Notice the texture of yogurt on your tongue. Truly taste your meal. Experience each bite from start to finish. Watch a baby eat for lessons on mindful eating! Sure, you’re busy and have a lot “on your plate.” It’s hard to make eating a priority rather than an option or side task. If you get the urge for a snack while doing your homework or studying, stop and take a break so that you can give eating 100% of your attention. Try to avoid multitasking while you eat. When you eat, just eat. How hungry am I on a scale of one to ten? Gauging your hunger level is a little like taking your temperature. Each time you eat, ask yourself, “Am I physically hungry?” Aim to eat until you are satisfied, leaving yourself neither stuffed nor starving. Observe how critical thoughts like “I don’t want to gain the Freshman Fifteen.” or “I’m so stupid, how could I do that!” can creep into your consciousness. Just because you think these thoughts doesn’t mean you have to act on them or let them sway your emotions. Negative thoughts can trigger overeating or stop you from adequately feeding your hunger. Remember: A thought is just a thought, not a fact. Friends provide an enormous amount of support, but often it’s helpful to obtain assistance or a second opinion from a trained professional. 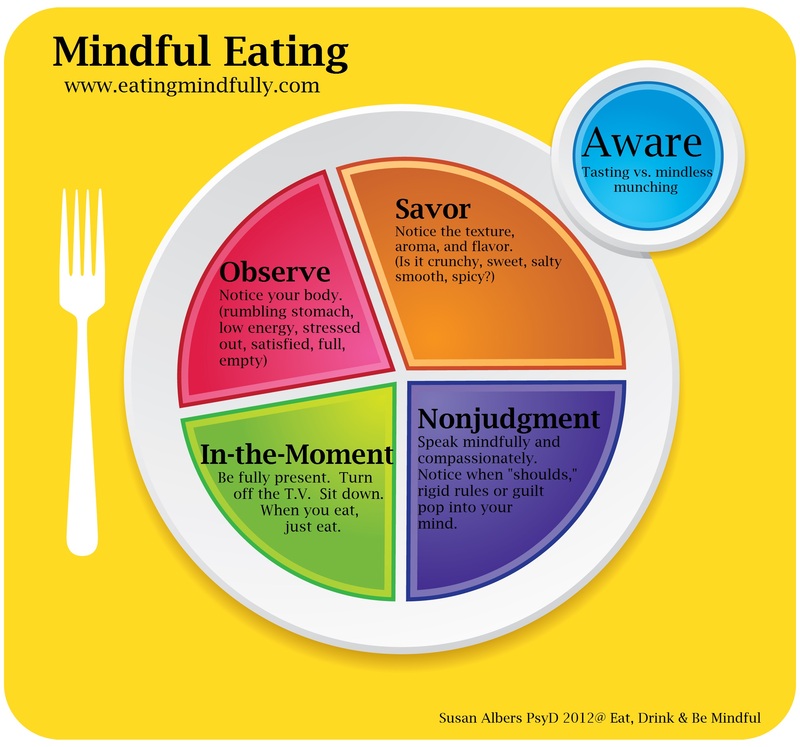 If you would like to learn more about mindful eating, or if you have concerns about your eating habits, call your college counseling center, student health center or consult the NEDA website for information and treatment referrals. Being more attentive and aware in all aspects of your life can help you to improve your eating habits. This is good news if you aren’t ready to change what you put on your plate. Start by being more mentally present with your significant other, put away your cell phone and be more engaged with what you are doing and do one thing at a time instead of multitasking. When you are ready to change your meal habits, you will have more practice on how to be attentive and present. It’s easy to eat an entire plate of food and not taste one bite. Body: How does my body feel before and after I eat? Low energy? Stomach rumbling? Full? Empty? Feeling: What do I feel about this food? Guilty? Pleasure? Joy? Disappointment? Regret? Thoughts: What thoughts does this food bring to mind? Memories? Beliefs? Myths? Fears? Mindful eating is something that takes ongoing attention and awareness. It’s not something that you practice for a few weeks and then, presto chango, you’re a mindful eater forever! Like most things in life, it takes patience, diligence, work, and attention. The reward? Feeling empowered, gaining control over what you eat, meeting your health goals, freeing your mind from feelings of guilt associated with food, and finding peace with food so that eating is an enjoyable and nourishing experience! I love your blog Chris! The information is so practical and worthy of my time. I grow a little every time I read Naked Eating. I'm so happy to hear that the information has been valuable to you :D Thanks for sharing such kind words!